Oh, how I’ve missed you! A whirlwind winter of work (weally?) has kept me from blogging. But even when I’m not writing about them, I’m thinking about Toronto gardens. Even when I’m far from Toronto. Taichung, in central Taiwan, has a population roughly equivalent to Toronto’s 2.5 million. Think about that as you read these highlights. 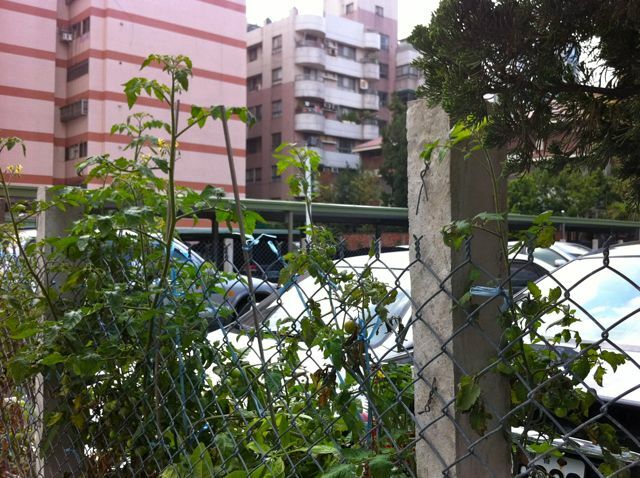 One thing I’ve enjoyed about visiting Taichung is its frequent use of living walls, particularly on building hordings. What an attractive alternative to plywood, plastered with torn signage. This one makes use of tropicals. Here you can see the pocket style of construction, and embedded irrigation heads. This might not work in our climate. This living wall, on the other hand, masses pots of sedum on shelves. The caged material above and below is charcoal. I imagine that rainwater filtering through the system would be purified, like an elongated Brita filter. 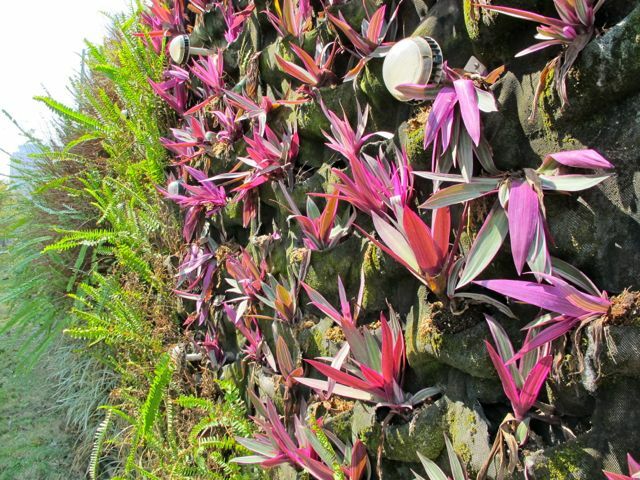 Then again, in Taichung, as in Toronto, some living walls are more practical than aesthetic. Tomatoes, anyone? 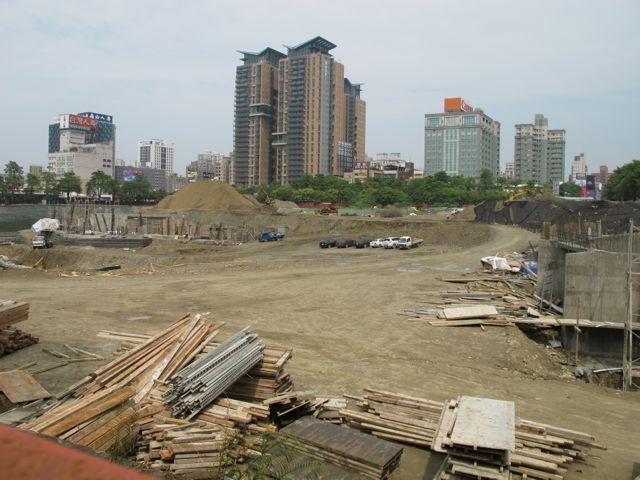 Taichung is undergoing a period of city building. This giant hole will soon be a brand new urban park called Autumn Red Valley. The huge, L-shaped park will include a man-made lake. Adding to the spirit of urban renewal, around the corner from Autumn Red Valley park – and eventually to turn a corner and connect with it – is this block-long articulated streetscape donated to the city by my client, Pao Huei Development. They engaged the design expertise of Boston landscape architect Michael Blier of Landworks Studio. This was installed only two to three weeks before my photo was taken. Note how mature the trees are. 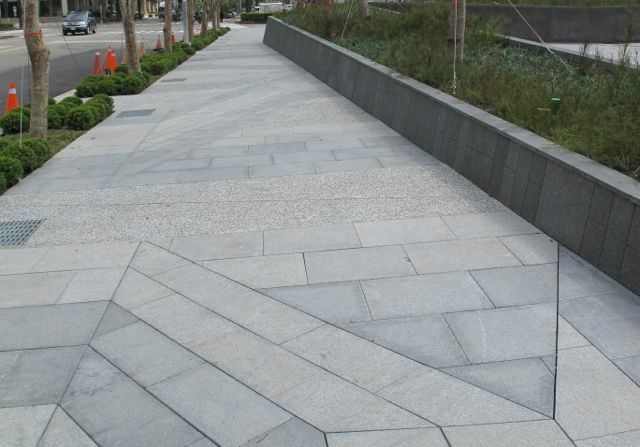 I like the way the faceted paving pattern – using mostly standard pavers – breaks up the long, linear space. 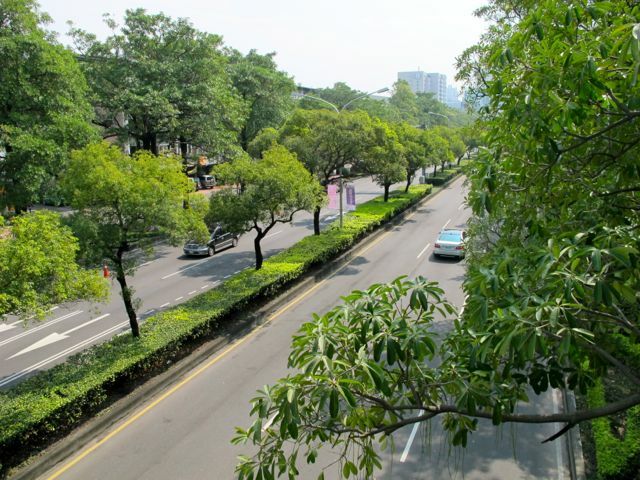 While we’re on the topic of streetscapes, it always amuses me that, in warmer countries, street trees can be the same as those we’d use as houseplants in Canada – such as these Schefflera trees along Taichung Port Road. 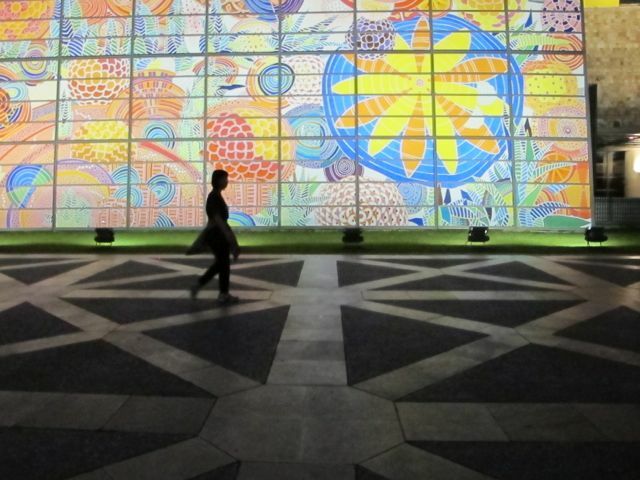 Flowers come out at night on this giant mural at the National Taiwan Museum of Fine Art. 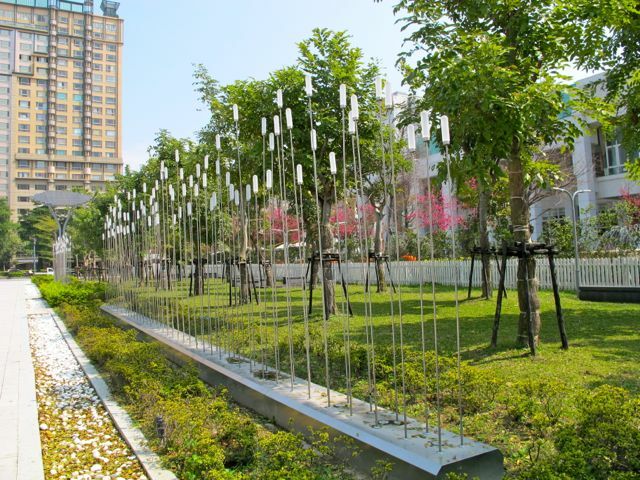 The Museum is at one end of another large city park in Taichung. 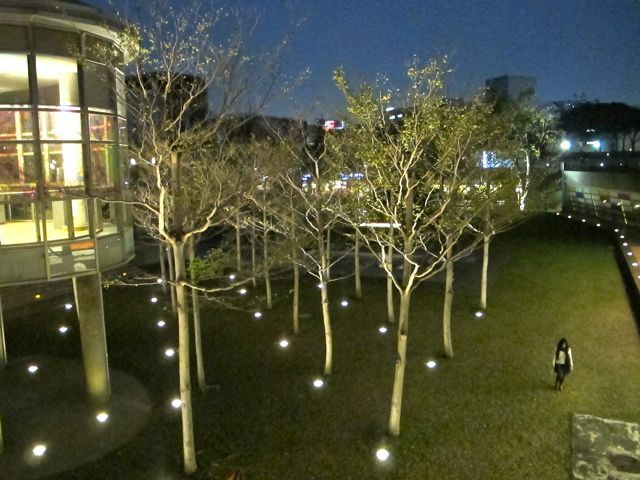 These uplit trees look sculptural beside the entrance. Night is also a good time to peer into windows. 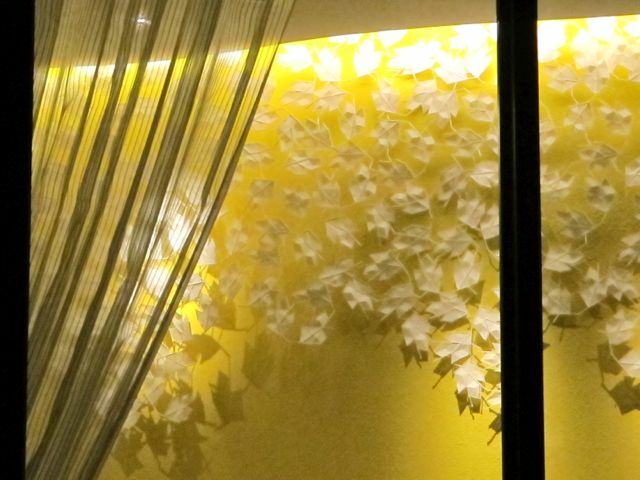 Eye-catching paper leaves on a restaurant wall. They say every part of the daylily is edible. Here, I had my first taste of immature Hemerocallis flower buds, which were crisp and slightly lemony. The dish was delicious. I wondered why you had disappeared:) Taiwan looks nice. I was there as a kid in 1978. All I remember was everyone riding bicycles. Those green walls are fabulous. I love how they use charcoal to purify rainwater. 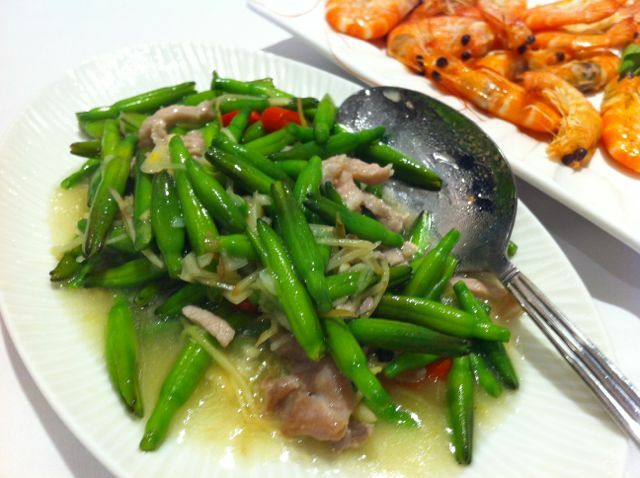 I never would have thought to eat Hemerocallis flower buds. But that's the best thing about travelling, tasting new food. Taiwan was my introduction to Asia, and it's an amazing place. I've only travelled there twice on business, but I'd love to go back as a tourist. They're still riding two-wheelers, Melanie, but now they're motorized. Scooters are everywhere! What a great opportunity! 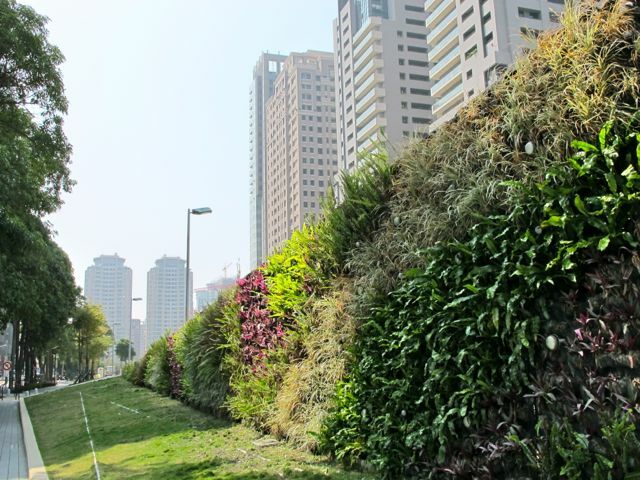 The living walls are awesome – so much prettier than concrete! 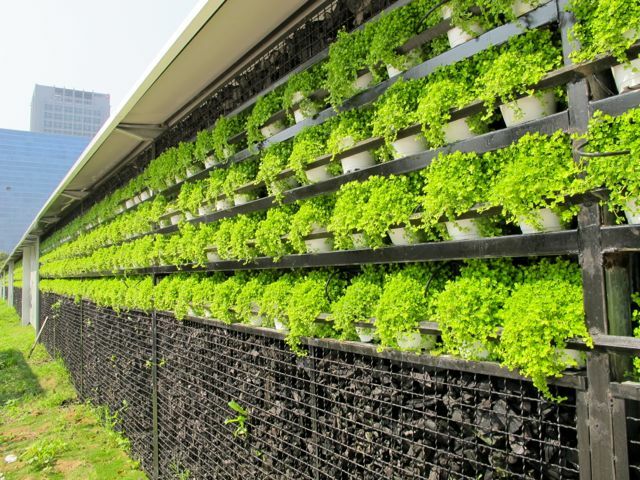 I'm told that living walls are mandated by the city in certain areas of development, such as around the construction site for Taichung's new opera house. It makes all those construction cranes much easier to look at. I love the green walls too. 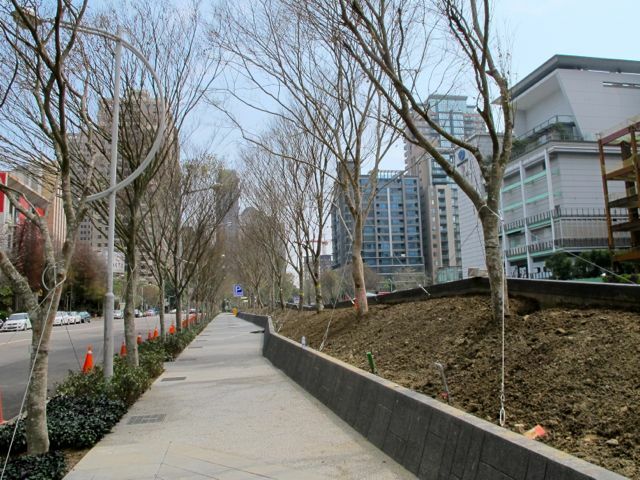 Imagine transforming all the ugly sound barrier walls here into green ones! I remember seeing masses of spider plants and croton as boulevard beds in Hong Kong, and we baby them here. 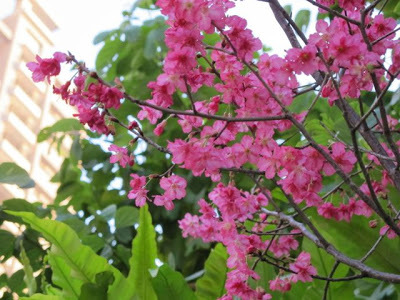 Did you visit other locales in Taiwan? Paul, As it was a business trip, I was restricted to Taichung and a day in Taipei, and had to hurry there and back to do the work we were meeting about. However, we did get to do some touristy things, such as go up Taipei 101 and spend a scant few hours in the National Palace Museum in Taipei. What an incredible collection of Chinese antiquities! As I said to Melanie, I'd love to go back.